Larimar is a fairly recently discovered stone, It is a form of Pectolite and is from the Dominican Republic. It can exhibit the colour of blue, red, green, and/or white, sometimes featuring a chatoyancy, a band of bright lustre caused by reflection from inclusions in the stone. It is considered to help release the self-imposed blockage or constraints one can put on themselves. It may help one from being self sabotaging, and assist in taking control of life. It is said when moving through periods of stress and inevitable change, it may enable challenges to be met with equanimity. Larimar is said to bring serenity, clarity and constructive thoughts. 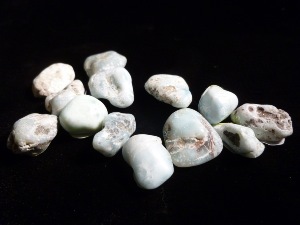 Emotionally Larimar is said to bring a calmness and equilibrium, may help with extreme emotions and bipolar disorders. It is believed by some to be a 'spiritual stone’ that radiates love and peace and promotes tranquility. 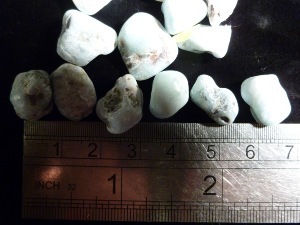 Larimar Natural Beach Polished tumbled to a smooth finish, an ideal pocket size stone, small enough to carry around with you. Tumble Stones can also be placed around the home for their energies or can just be nice decorative items.